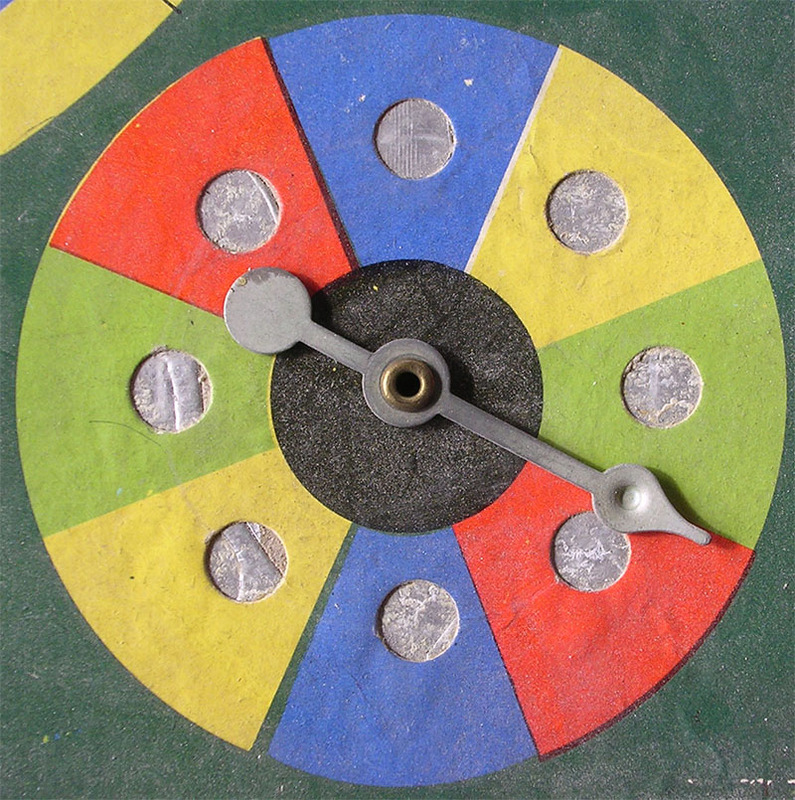 This is a game which belonged to the collection of my late friend Geert Lagrou. Its main feature is that it is battery operated. Instead of dice it uses an electrical spinner. What is strange is that the game was produced in the same box that this other game. 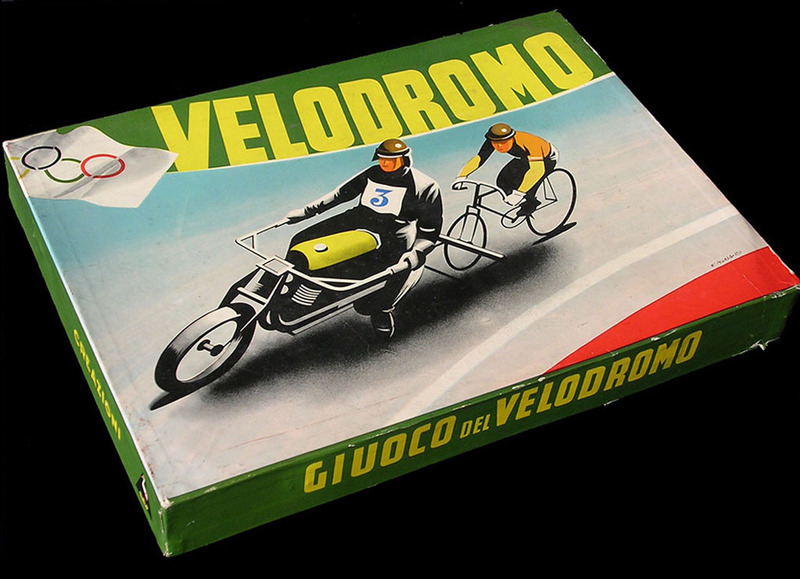 It is hard to say, but my guess is that this electrical game was produced later and that the boxes, riders, and even set of rules were reused from the previous game. Reusing the rules was specially unsuitable, since they mention features that are impossible with this board (for instance the "corsa a sei"), and they only mention the race incidents present the other board. In fact, the first time I read the rules of this game I suspected they were the rules of another game which had been misplaced in my friend's copy of the game. However, I have seen more copies of the game for sale (both versions) and they had the same rulebook. The mistery was solved (at least partially) when I was finally able to find a copy of the other version of the game. You can see the rules at the bottom of this page. The race incidents on this board are: "strada rotta", "strada sdrucciolevole", "guasto di vettura", "uscita di strada", "incendio della vettura", "vettura rovesciatta". These are hardly cycling incidents. One would rather think of a car race. In fact, one would unmistakably think of a car race with these incidents ("broken road", "slippery road", "car failure", "road exit", "car fire", "overturned car"). 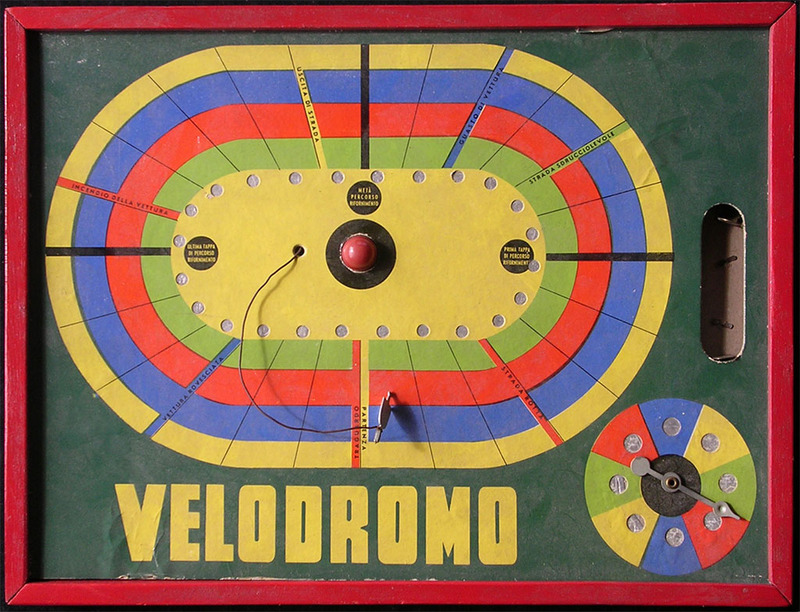 But of course there are the big "VELODROMO" letters on the board. The spinner. I am not very sure how it is supposed to work. 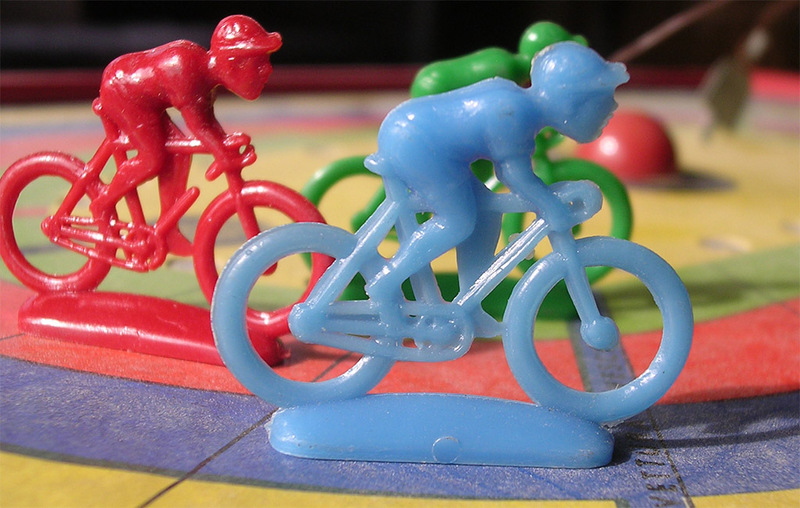 Since I do not have the game I cannot check the size of the cyclists, but I am convinced that they are identical to those on the other version of the game. Of course there is at least one yellow rider missing, thoug I do not know if there were any other elements in this game.